I figure I might as well do a post that ties in with the latest Transformers film. If I don’t review it now, when will I? I’ve only ever seen the first live action film and that was enough for me. I thought I was a huge Transformers / GI Joe fan growing up but the more I hear how other people talk about them, I realized I must have only been liking the properties for being staples of the 80s. I was more of a Teenage Ninja Mutant Turtles / He-Man fan, that is where all of my parents’ money went into, especially Ninja Turtles. I did like the 80s Transformers : The Movie, and that soundtrack has to be in the top ten greatest soundtracks of all time but that’s probably the most I’ve ever seen of the franchise. I was one of those that was all types of upset when Michael Bay casted (I’m not sure he was barely involved in the decision) Peter Cullen as the voice of Optimus Prime but not Frank Welker for Megatron. Such a disappointment. When I first read this, I was way confused and nothing made sense, let’s see if that’s still the case. Turns out, it is super reader friendly, I must have just breezed through it, thinking it wasn’t really a book I was buying for the contents. The issue really benefits with coming out during the mid-80s where the editor caption boxes are a plenty, even citing which story elements were carried over from the previous issue. I also like how all the Transformers call each other by their names, when they first see each other. I didn’t have to guess at all at who each character was. Cover has Menasor as the representative. Not Megatron as I’ve been under the impression. Makes sense as it is Menasor’s first appearance in this comic. Also, once I read the issue, Megatron’s helmet (if that is what we call it) is colored dark blue instead of matching his face. So now he looks like the evil version of Optimus Prime (from the neck up). The cover is also the only place to see Menasor’s face properly. In the issue, we get all sorts of angels but not a clear shot of his face. There is a Wiki for everything now! This site has some a pretty good review of the issue, plus pictures! Of course, then I just simply read the comic and it was super easy but it is nice to see where characters land in the mythos. There is a good version of Menasor, his name is Superion. The Autobots who form him are called – the Aerialbots. Superion’s first appearance was the previous issue. All characters could have been on the cartoon first though, that I wouldn’t know. Inside front cover ad is for M&Ms, so strange seeing the non-modern day characters. Issue itself opens with Mr. Barnett and Circuit Breaker reviewing footage of Transformers and some police vehicles. Circuit Breaker, though a robot sounding name, is actually a woman. We get a one panel origin story. She was a genuis who was caught up in an explosion that left her crippled. The explosion was done during a fight between the Autobots and Decepticons. She created a cyborg suit so she can still walk around. Why she doesn’t wear clothes over the suit, is beyond me. Circuit Breaker hates robots, which I get. Barnett is wondering if they should be giving the robots a second chance – some seem to be okay. They mention their team, RAAT, which stands for – Rapid Anti-robot Assault Team. Barnett started his own agency, III – Information and Intelligence Institution. I do enjoy how often these captions appear – one per page thus far. Circuit Breaker’s incident happened in issue 6. Barnett tries to give her a bonus for capturing some robots, she doesn’t want the money – only justice! They walk by a wall with the captured robots heads on it. Those Transformers are dead. Meanwhile, at the Ark – the home of the Autobots. It is their ship that crashed into Mount St. Hilary, the Oregan volcano. Rachett, the Autobot medic, is looking over Optimus Prime. We start the process of all robots calling calling each other by name, as quickly as they can. Bombshell, a miniature Decepticon, who is in the Ark, biding its time. It has been there since last issue. 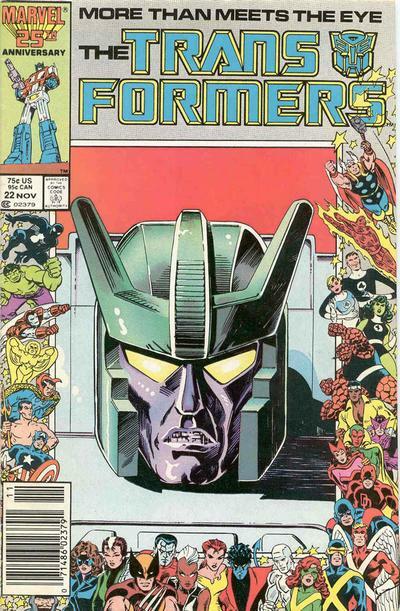 Optimus Prime was injured back in issue 19. Rachett turns his back, and Bombshell makes its move. Bombshell injects Optimus Prime with an item it calls, a cerebo-shell. It believes it should give it full control over the Autobot leader. Turns out, it doesn’t have control over him, but it can read his thoughts. Optimus Prime enters a room where Wheeljack is injecting Skids with a chemical tracker. They plan on following the trail of Transformer fuel that Donny Finklerberg found last issue. In issue 18, seven Autobots landed on Earth from their home planet of Cyberton. Donny, a human, told them this after he escaped from the Decepticons. Optimus Prime sends Donny and Skids out to follow the trail. Donny is reluctant but they take his wallet with a huge check he was given, so he has to go along on the mission. In issue 15, Walter Barnett paid Donny to play Robot-Master for III. This is the only reference that isn’t further elaborated on. Optimus Prime instructs Wheeljack to ready the Aerialbots for matrixing – the process that gives the robots life. We cut to Eastern Wyoming, at the former coal mining plant that is now the base of the Decepticons. Honestly, I have to give it up to Mr. Budiansky, he wrote a perfect issue that never leaves me with unanswered questions. Megatron, who has dark blue hands to match his helmet, is speaking to Soundwave. Megatron isn’t disappointed by the lack of control over Optimus Prime, they can still take advantage of the cerebro shell. Last issue, the Aerialbots were sent to the Hoover Dam and performed poorly as their programming wasn’t complete. Optimus Prime had Wheeljack swipe their old programming and is about to give them a new chance at life. When he does it, Megatron uses the cerebro shell to hijack the matrix to grant life to his Stunticons. Meanwhile, Skids, is in his shape of a blue van, and Donny are following the trail. They witness a vehicle swerve off the road and into power lines. Skids transforms into his proper shape and saves the lady driver. The lady driver goes on the news with her story. This gives RAAT a radius of where one rogue robot is. Megatron also sees this coverage and sends out the Stunticons out to undo the good press the Autobots are receiving. I suppose at this point, the two robot fractions have been able to keep their war a secret one. The Stunticons are, individually – Dead End, Wildrider, Breakdown, Drag Strip and their commander, Motormaster. Donny isn’t sure if it was worth blowing their cover. They pull into a motel. Skids reveals that all Transformers have a button that keeps them in their transformed state, which they do to conserve energy. The next day, as they are driving – the Stunticons find them. Instead of attacking Skids, they start destroying all the other vehicles on the road. Skids requests emergency reinforcements. Just then, the Stunticons further transforms into Menasor. RAAT shows up and barely causes a distraction. Circuit Breaker, alone, does better than her team. The Arialbots show up, they are – Slingshot, Air Raid, Fireflight, Skydive and their leader, Silverbot. I’m sure we are suppose to note the difference between leader and commander. The Arialbots transform into their giant combined form of, Superion. They start fighting like giant robots do. Donny tries to reason with Circuit Breaker, telling her that there are good robots and bad. Her point about how much destruction, still stands, as cars start being used as grenades. Barnett rescues Circuit Breaker from a failed attack of hers on the giant weapons. Issue ends with Donny pressing Skids button for the night, then calling Barnett, asking how much he would pay for a Transformer, with no muss. $50,000.00 seems reasonable for betrayal. Pretty good issue, I have no idea what happens next. I imagine that the Autobots win and the Decepticons lose.